Last year’s release of PhoneValet 2.0 brought telephone communications management back to the Mac with Caller ID and announcements, call logging, voice mail, phone-based remote control, call recording, and shared voice/fax management on the same phone line. Parliant has released three significant upgrade options to their PhoneValet software. The purchase options can be a little confusing, so it’s important to clarify those up front. For new users, PhoneValet 3.0 ($200) includes the PhoneValet USB Telephone Adapter with PhoneValet 3.0 software. PhoneValet PodCast ($250) includes the PhoneValet USB Telephone Adapter, PhoneValet 3.0 software, BIAS Peak Express 4, and SoundSoap 2. Those who already own the PhoneValet USB Telephone Adapter hardware can choose from the PhoneValet 3.0 Upgrade ($30) or PhoneValet PodCast ($75) including PhoneValet 3.0 software, BIAS Peak Express 4, and SoundSoap 2. Both new and upgraded PhoneValet 3.0 users can choose the optional PhoneValet Anywhere ($80), which enables Web and network access to the call center using OS X’s built-in Web server features. Since last year’s review the rock-solid reliability of this product has been impressive—PhoneValet 2.x ran perfectly without even the smallest glitch for the entire period of use. There are two existing PhoneValet features that have proven indispensable over the last year. PhoneValet can e-mail missed calls to specified e-mail accounts, including Caller ID and any voice mails associated with the calls. Call Recording has been extremely useful for dealing with customer service and tele-marketers, helping us resolve over $500 of “billing issues” from unscrupulous businesses. Over the last year the only major feature we found missing was call blocking. Most telephone companies offer blocking for a few phone numbers, but their call blocking limits are easily exceeded by companies that purchase multiple prefixes. PhoneValet 3.0 resolves this problem and offers even greater flexibility with Call Profiling. PhoneValet uses Caller ID to perform a user-defined series of actions stored in a profile. These actions include custom ring-tones, custom greetings, sending the caller directly to voice mail. sending the caller to a voice mailbox, hanging up, or a combination of the preceding options. 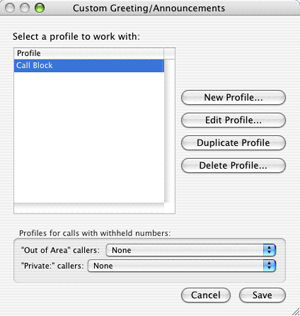 For example, call blocking is possible by combining a custom greeting followed by hanging up. Custom Profiles are easy to create using PhoneValet’s preferences. A profile can be assigned to individual or multiple phone numbers, to out-of-area numbers, or to “private” numbers that don’t appear on Caller ID. There are many Profile options. Not only can you avoid telemarketers, but you can also record special messages for family, friends, or even your in-laws. Parliant has joined the podcasting phenomenon with their PhoneValet Podcast bundle. This includes the PhoneValet 3.0 software and BIAS’s Peak Express 4 and SoundSoap 2. Peak Express allows users to perform basic editing and optimization tasks with audio files, and SoundSoap is one of the premier tools for audio cleanup. SoundSoap is remarkably easy-to-use for eliminating unwanted noise and artifacts from not only recorded phone calls, but any audio source. This bundle is a significant value, considering SoundSoap 2 retails for $99 and the $30 PhoneValet 3.0 upgrade is included. Parliant offers a Peak Express/SoundSoap tutorial <http://www.parliant.com/support/phonevalet/podcasting_tutorial.html> __ on their Web site. 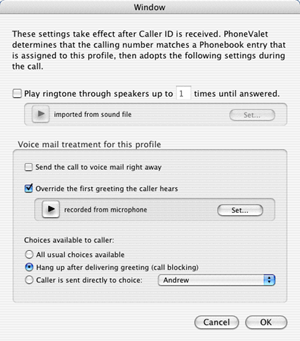 Older versions of PhoneValet offered two basic methods for remote access: the e-mail feature described previously, and the ability to access messages by calling from another phone. PhoneValet Anywhere takes remote access much further by offering two new network features. PhoneValet Anywhere is built-in to PhoneValet 3.0, but activated only when the purchased codes are entered into the PhoneValet preferences. Once the code is entered, the server options become available. Two user accounts are included, but additional accounts can be purchased from the Parliant Web site. Live incoming call information is displayed by remote computers (either on the local network or on the Internet) by installing the PhoneValet Client software. The client software is available for both Mac and Windows. Caller ID for incoming calls to the PhoneValet server (the Mac connected to the phone line and running the PhoneValet software) are displayed on the computer(s) running PhoneValet Client. 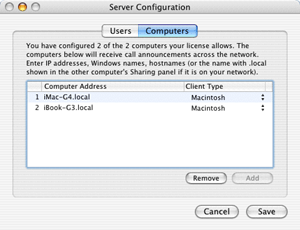 Macs running the client can both display and announce the caller through audio, whereas Windows computers can display Caller ID information only. The display window has five options for display size and whether verbal announcements are used. The client software runs unobtrusively in the background, only displaying information when calls are announced. The PhoneValet server automatically detects any networked machines that are running PhoneValet Client. PhoneValet Web Access offers several additional features. The Phonebook, Call Log, and Message Center are all accessible through straightforward Web pages—playback of voice mail and call recordings is seamless. Notations for each entry can be added and edited using a Web browser. There is also a Call Report feature, which creates logs based on time, date, caller info, notes, duration, and several other criteria. These features can be accessed either though Rendezvous/Bonjour or by accessing the server’s domain or IP address. 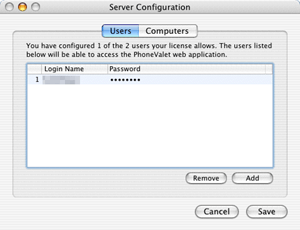 Anywhere’s Web Access requires OS X’s built-in Web server to be activated, done simply by accessing System Preferences, Sharing, and turning on Personal Web Sharing. PhoneValet Web Access is restricted to defined users with passwords, keeping information safe from unwanted users. PhoneValet 3.0, PodCast, and Anywhere offer a significant upgrade to the previous PhoneValet products, and they offer the same ease-of-use in previous versions while greatly extending the features. The PodCast bundle is a great value, but it is Anywhere’s network call center access that makes this upgrade most remarkable. Whether for new or existing users, PhoneValet 3.0, PodCast, and Anywhere offer a robust and affordable telephony solution for home and small businesses. Copyright © 2005 Andrew Kator, akator@atpm.com. Reviewing in ATPM is open to anyone. If you’re interested, write to us at reviews@atpm.com. As of November 18, 2005 PhoneValet PodCast includes BIAS Peak Express 5 instead of BIAS Peak Express 4. SoundSoap 2 is still included.